When you and your pet have a strong bond it can be difficult, even impossible, to imagine leaving him or her behind when you go somewhere. 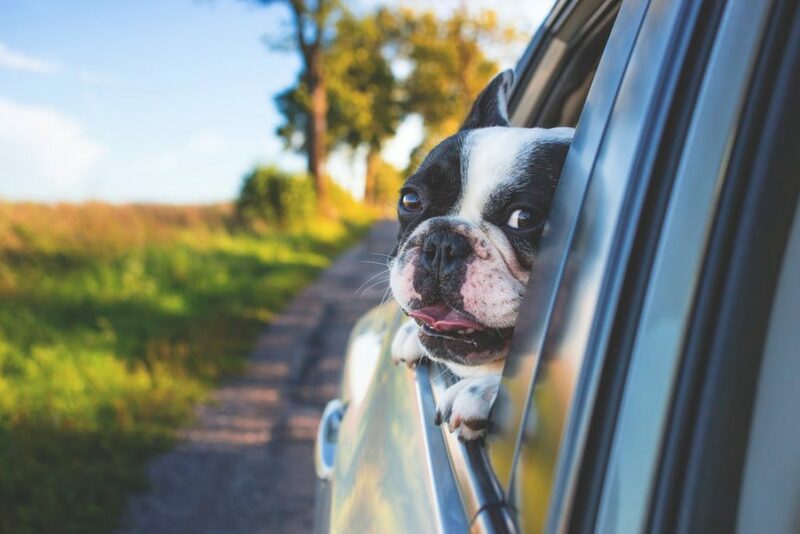 When traveling to close-distance places, such as the store, the vet, or the dog park, traveling with your furry companion usually isn?t too stressful. However, when going long-distances for a vacation or a permanent move, traveling with your pet can become daunting. Many pet owners believe tranquilizing their dog is a good option when they are required to drive or fly for hours. However, unless your vet suggests tranquilizing your pet, it usually isn?t the best idea. Traveling can be stressful for some animals and tranquilizing them denies them the opportunity to adapt to their situation along the way. Luckily, there are other ways to help ease you and your pet?s anxiety about traveling. No matter where you are going, or how you are getting there, successfully traveling with an animal just requires the proper preparation. Follow these tips on how to make your pet?s transition as stress-free as possible. Some dogs love going for a ride in the car, no matter how long the car ride may be. Nothing is better than sticking their head out the window and barking at all the passing objects. However, having an excitable dog may be nerve wracking for you, as you worry about them jumping into the front seat and distracting you. Therefore, purchasing a harness is one way to calm your nerves, while still allowing your dog to enjoy the ride. Of course, dogs who have never worn a harness will need to get used to wearing one before the trip. To get your dog accustomed to wearing a harness, either take him or her on short trips first or have him or her wear it around the house beforehand. Make sure when purchasing a harness, you choose one that is designed to connect to the seatbelt buckle. Otherwise, the harness won?t keep your dog in place properly and you will have wasted money. There is also a leash alternative: the leash clicks into the seatbelt buckle on one end and attaches to a dog?s collar on the other end. Just like humans, dogs get bored when forced to stay in one place for a long time. They need something to entertain themselves with. While you will have to stop for bathroom breaks, which is a perfect time to give your dog some exercise, your dog will still need some stimulation for the hours in between those breaks. For individuals unsure of what toys to bring, check out this list of chew toys for dogs to find out which toys are best for your dog. However, you may want to avoid bringing along noisy toys that will drive you crazy. Along with toys, pack some snacks, water, and ice cubes. Snacks will help keep your dog from getting too hungry and ice cubes will help with motion sickness. When traveling with a dog, or any animal, it?s essential to scout out the route before you leave. It won?t be fair to your dog if you are completely unprepared for what might happen. For example, if there is a stretch of highway with heavy construction, you will want to know ahead of time. This way you can stop to let your dog out to go to the bathroom or stretch his or her legs before you reach that area. Not all hotels will allow pets in the building either. Therefore, if you are one of those people who likes to drive until you?re too tired to go any further, it?s time to rethink that strategy. It is important to find hotels that are pet friendly before leaving for the trip. If you don?t, it might be difficult to find a hotel that will accommodate your furry companion. Furthermore, you don?t want to be surprised by any pet restrictions either, such as a ban on certain dog breeds or sizes. Don?t end up sleeping in the car because you failed to prepare ahead of time. Not all pets like to wear collars or tags and not all owners force their pets to wear them. However, if you are traveling out of state, or out of country, with your dog you must have the proper identification for him or her. There could be severe consequences if you don?t. For starters, the unthinkable could happen: your dog could escape and become lost. If this happens and your dog does not have a collar and tag on, then the chances of your dog being returned become slim. Make sure you dog?s tag has your address and phone number etched into it. Furthermore, a dog tag usually includes the date of his or her?s last rabies shot. Someone will be more likely to approach your dog if they know he or she is updated on their shots. Proof of a rabies shot will also protect you from fines. Before traveling, you may want to microchip your pet. This will allow any vet to track you down if your dog gets lost. Another clever idea is to bring a photo of your dog along. This way you can show the picture to people you come across. For individuals who will be flying with their pet, a trip to the vet is required. Airlines require you to present a health certificate clearing your pet for air travel. However, even if you are driving to your destination, bring your pet in for a vet visit. Veterinarians are a great resource to utilize, especially if they are familiar with your pet?s behavior and personality. They can recommend carriers, harnesses, snacks, and toys that will make traveling less stressful for your pet. They will also determine if your pet will need medication to keep him or her calm during the trip. Furthermore, research or ask for recommendations of vets that are in the area you are traveling to. Your pet should be a top priority while traveling. Therefore, knowing the vet clinics in the area will prepare you for any emergencies that may arise. Keeping these tips in mind, traveling with your beloved pet becomes a lot less of a hassle. Finally, both you and your pet can instead enjoy the trip with each other?s company. Anna Smith resides in beautiful Santa Monica, CA, where she works as a Pet Nutrition Expert in a leading retail pet store. She is responsible for nutritional strategies for different breeds and development of new products on the market in compliance with Association of American Feed Control Officials. Anna?s passions are education about proven methods and best practices in the industry and her dog Max, who is always well-fed. She also curates content for http://dogsaholic.com/.